The Renard R-31 was a Belgian reconnaissance aircraft of the 1930s. A single engine parasol monoplane, 32 R-31s were built for the Belgian Air Force, the survivors of which, although obsolete, remained in service when Germany invaded Belgium in 1940. 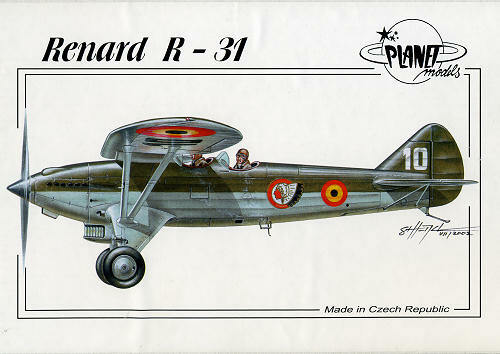 The Renard R-31 was the only World War II operational military aircraft entirely designed and built in Belgium. The R-31 entered service with the Belgian Air Force in 1935, replacing the Breguet 19 in the 9e and 11e Escadrilles d'Observation based at Liège. In service, it was not popular, as it had poor handling, being vulnerable to entering flat spins if mishandled, with all aerobatics therefore being banned. The R-31 was hopelessly obsolete, and those that were not destroyed on the ground in the early hours of the German Blitzkrieg invasion of Belgium in May 1940 were ravaged by German fighters as they bravely attempted to gather information on the German invasion. None apparently functioned as ground support aircraft during the brief Belgian Army resistance, flying 54 reconnaissance sorties in support of the Allied forces defending Belgium, with the last mission (which was also the final mission flown by the Belgian Air Force in its attempt to repel the Germans, being flown on the afternoon of 27 May 1940. Following the German occupation of Belgium, the Luftwaffe had no interest in the machines and those that had survived the initial onslaught were unused or were destroyed. Overall, these machines had no significant impact on the war although they were briefly involved. The kit is contained within a segmented poly bag which itself is in a very thick cardboard box. Despite these precautions, I found that one part had broken away from the pour stub, leaving a small portion still attached to the stub. The kit itself has but 26 parts, one of those being an acetate sheet for the windscreen. The entire fuselage and fin/rudder assembly is molded as a single piece, making construction much easier. Thank you. The one piece wing is quite thick so will not suffer from any warping problems. Interior consists of a floor, two side panels with framework detailing, a control stick, instrument panel and both pilot and observer's seat. Once that is in place, an upper fuselage section with rear gun and mount are installed. The landing gear and wing struts appear to be a bit on the flimsy side, but my experience with these things is that once all the parts are in place, things will be quite sturdy. The upper wing actually sits atop the fuselage on a small fairing so that will keep the wing from wobbling around while attaching the main struts. I fear for the life of the very scale and very thin tail skid so one might want to substitute something stronger. Instructions are a very well drawn folded single sheet with a parts diagram and two exploded construction drawings on one side and a history and paint/decal placement guide on the other. 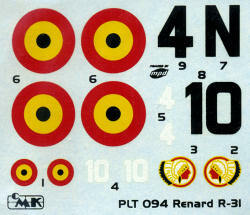 Markings are provided for two planes of the 11th Squadron of the 1st Regiment in 1940. Both planes are painted in Khaki over Silver (though the box art shows the underside in light blue). The only difference between the two planes is the aircraft number. The decals are superbly printed and should work very well. Not your normal aircraft, but then that is why companies like Planet Models exist. They provide those of us who like something a bit different from the norm. 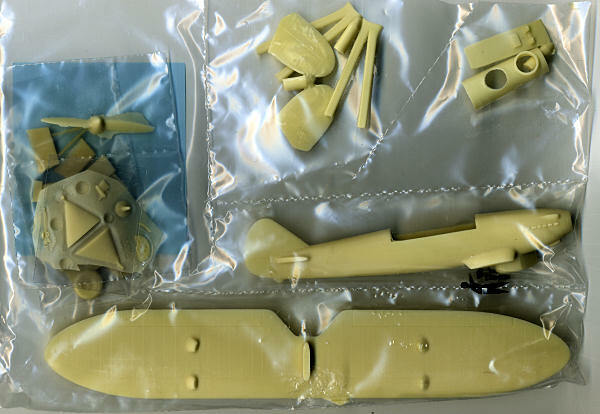 These kits are superbly molded and not difficult to construct. If you have not tried a resin kit, then this would be a nice on with which to start. Got this one on deep discount or it would still be on the shelves.